Sailing out of Ontario’s historic Port Dalhousie on a morning in late June, the tree-lined shore of western Lake Ontario looks as it must have the morning of August 8, 1813 just hours after two United States Navy warships, the Hamilton and Scourge, slipped beneath the lake’s surface into its cold, dark waters taking 53 sailors to their watery graves. On Parks Canada’s research vessel the Investigator, we head out to the spot several kilometres away where, 200 years ago, the Hamilton and Scourge settled to the bottom, upright, 88 metres below the surface. On board the Investigator are Chriss Ludin (at the helm) and marine archaeologists Jonathan Moore and Ryan Harris. Moore overseees the Hamilton and Scourge survey. 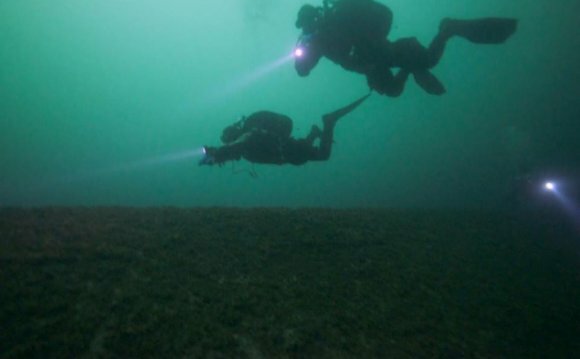 Harris is also leading the search for the Franklin Expedition's lost ships in the Canadian Arctic. Joining us on the Investigator was Peter Rowe, who is producing Shipwrecked on a Great Lake, the real-life story of Ned Myers, a Canadian-American sailor who survived the sinking of the Scourge. As a little boy at my parent’s cottage during the 1960s, I read James Fenimore Cooper’s A Life Before the Mast, a biography of Ned Myers, and as a scuba diver and historian I’ve followed the discovery of these two ships closely. Found in 1973 by Daniel Nelson, a dentist from St. Catherines, Ont., the Hamilton and Scourge have attracted undersea greats such as Jacques Cousteau (1980), Emory Kristof (1982) and Robert Ballard (1990). 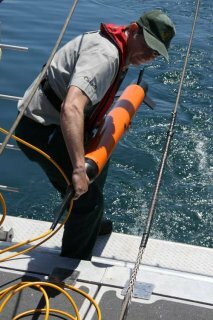 Our expedition is the first to use a magnetometer to gather data from the Hamilton and Scourge sites. The Hamilton appears in the sonar image. In addition to the magnetometer, the team also uses side-scan sonar to check on the ships. We learn that there have been no major changes to the site since the last expedition in 2009. “The mast standing (on Hamilton) as of 2009 (is) still standing in 2013, " Moore says. 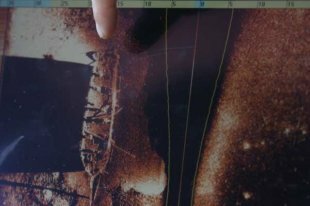 “We also saw that the extent of mussel beds (which cover artifacts) detectable on the lakebed were about the same."